The Cougars swept through the SJHSHL Tier-II playoffs despite returning only a few players from last year’s club. 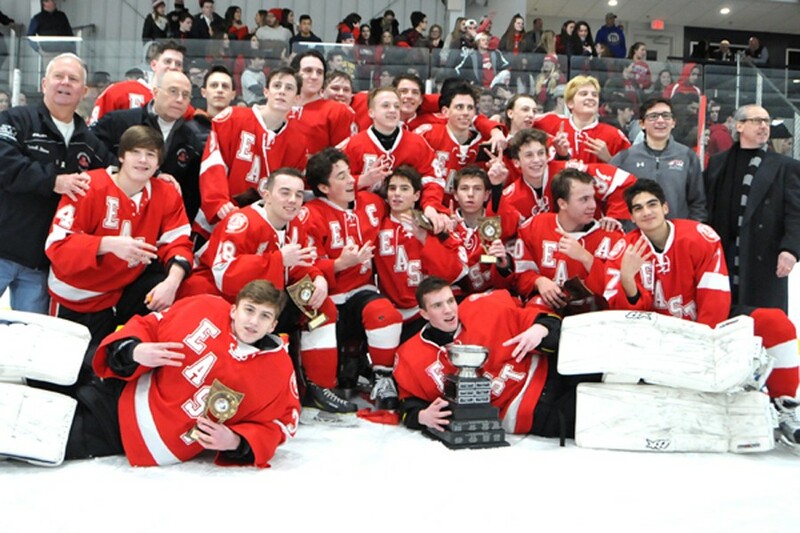 On Feb. 22, Cherry Hill East ice hockey’s varsity team made history when it won the program’s third consecutive South Jersey High School Hockey League Tier-II championship, defeating Holy Lenape Valley, 2–1, in the final game. However, this year’s team was nothing like the previous two championship-winning clubs. Cherry Hill East won the 2019 title with a ton of first-year varsity players. After returning just five players from last year’s team, the Cougars went into the 2018–19 season with a young team and a ton of roster spots open for competition. Papa and fellow senior captains Sean McKenna and Ben Isakovich were three of the five returning players for Cherry Hill East. It was their job to be leaders and help the younger guys along, especially early in the year. Isakovich said the competitiveness of the younger players was a big boost. “All of the guys are looking up to us, they want to keep up that winning mentality,” Isakovich said. One of Cherry Hill East’s biggest losses entering the season was on offense. The team lost its three top scorers from 2018 and Papa noted this year’s team did not have the offensive firepower of last season. In 2018, Cherry Hill East had seven players tally 20 or more points. This year, only Papa had 20 or more points. While Cherry Hill East scored fewer goals this year, head coach Scott Busler believed this year’s team was the strongest on defense out of all three championship clubs. McKenna said the forwards were challenged to get back on defense and embraced playing a two-way game. Isakovich praised the forwards for their shot-blocking and commitment to playing tight defense. Unlike last year, Cherry Hill East took some lumps over the course of the regular season. Against Tier-II’s top two teams, Holy Lenape Valley and Clearview, the Cougars went just 4–4–0 in the regular season. However, Papa said a hard-fought, 4–3 win over Holy Lenape Valley on Jan. 4 helped the team gain some confidence. Even though the team entered the playoffs as the №3 seed behind HLV and Clearview, Papa said the team had confidence. The Cougars’ confidence led to their strongest postseason run yet. To win their 2017 and 2018 championships, Cherry Hill East had to come out of the losers bracket in the SJHSHL’s double-elimination tournament. This year, there was no loss in the playoffs. Cherry Hill East went a perfect 4–0 to win the championship. After a first-round win over Riverfront, the Cougars’ defeated Holy Lenape Valley, 3–2, Clearview, 4–1, and Holy Lenape Valley again, 2–1, to sweep through the tournament. With the championship, Cherry Hill East became the first Tier-II team to win three straight titles. In all of the SJHSHL’s varsity levels, only Cherokee, which won four straight Tier I championships from 2011 to 2014, has won more consecutive titles than Cherry Hill East. “When I grow up, when I remember high school hockey, I’ll remember we won three times in a row,” McKenna said. While the three senior captains will be leaving the Cherry Hill East program, they believe the team’s run of championships isn’t over. With a majority of the team coming back in 2019–20, expectations will be high for the Cougars to win another title.